Symptoms: Pes Planus may manifest itself as pain in the feet and knees, and possibly in the hips and lower back as well. The pain or irritation in any one of these areas can vary immensely. Foot pain may feel sharp, dull, bruised, achy or tight. Overview: Pes planus, or flat feet, is a very common condition affecting up to one in four people. At birth, we all have flat feet, but most of us develop an arch in our feet by the time we’re ten. Those who do have flat feet have them because they either never grow arches, or because somewhere along the line their arches collapse which is commonly referred to as fallen arches. Flat feet are easy to spot. While seated, with your feet flat on the ground, you should see a raised area in the middle of your foot. 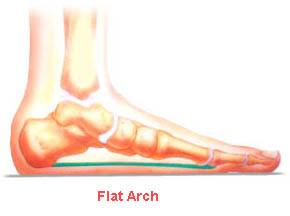 If you don’t and your foot is relatively flat on ground with no noticeable rise where the arch should be, you probably have flat feet. Flat feet in themselves may or may not result in long term effects. Some will experience quite a bit of pain from them, while others may have flat feet and never feel any discomfort. Flat feet are often a result of genetic causes where the arch never develops. However, flat feet may be caused, later in life, by structural abnormalities in the feet such as over-pronation, where the foot rolls too far inward while walking. Other causes of flat feet are found in involved in extended athletic activities or those whose job requires them to stand for extended periods of time. But even those who are more sedentary may suffer flat feet as their muscles gradually weaken over time and become incapable of supporting the arches. Age and weight also play a role in pes planus. Those who have worked on their feet for years often experience flat feet. Overweight people place added stress on their feet and legs which can also lead to flat feet. Both prolonged standing and excess weight may eventually cause the legs and feet to do more work than they are capable of. If you have flat feet, you should see Dr. Suzan Starler, D.C. whether or not you are feeling pain due to the condition. Dr. Starler will work with you to determine a plan of therapeutic management that can ease existing pain or prevent symptoms from developing later on.